As a middle-schooler, Jamie Dawson could be found at the lunch table with the kids who loved words. It proved a good training ground. Now a seasoned spoken word artist, Dawson is about to reach her largest audience yet. The UW–Madison senior has been chosen as the student speaker for winter commencement on Dec. 16 at the Kohl Center. She will be receiving a Bachelor of Arts degree with majors in Afro-American studies and psychology. All winter graduates were eligible to apply for the honor. The senior class officers made the selection. Dawson, born and raised in Tampa, Florida, says her early years were sometimes challenging. She and her mother spent years living with extended family in cramped quarters. During those times, she would dream of the kinds of educational opportunities that would one day come true for her at UW–Madison, she says. Long before her selection as the student commencement speaker, she thought about what she’d want to say about her journey to her fellow graduates. Her confidence comes in part from years of writing and performing. In high school, she produced a large body of work through a youth arts poetry collective, and she competed nationally at poetry festivals. At UW–Madison, she has been a member of the 9th cohort of the groundbreaking First Wave Hip Hop and Urban Arts Scholarship Program. Dawson is among the UW–Madison students featured in the recent First Wave documentary “Hip Hop U” by Wisconsin Public Television. She’s also featured on UW–Madison’s “Wisconsin Experience” website. 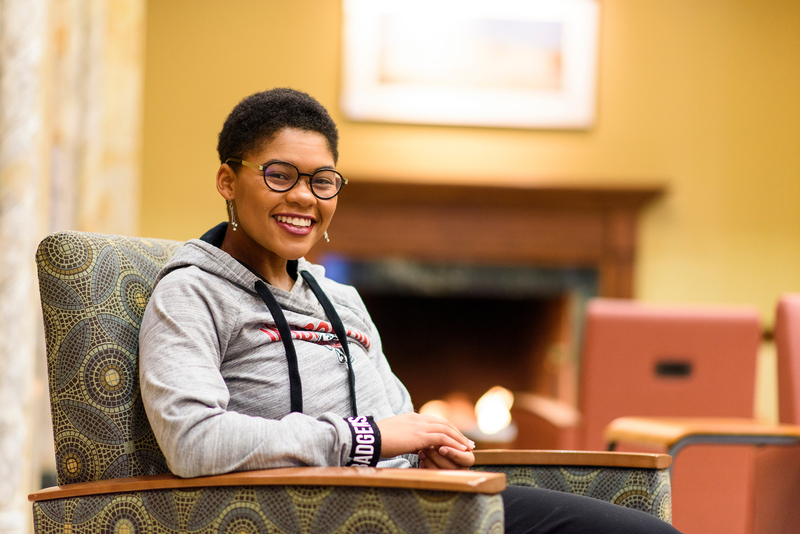 During her time on campus, Dawson worked as the house fellow for the Multicultural Learning Community, assisted with research at the Language & Cognitive Neuroscience Lab, and served as a student facilitator with Our Wisconsin, the identity and inclusion workshop for first-year students. In April 2017, Dawson was inducted into the Phi Beta Kappa Honor Society and has since served as a fellow for the Alpha Chapter of Wisconsin. During her summers, she studied abroad and interned in Brazil, New York, the Netherlands and Denmark. Dawson says she will stress in her commencement speech the power of individuality and the importance of owning your talents and using them to benefit others. She thinks her old friends at the middle school lunch table would be proud of her — but not surprised. They expected big things from each other. “Oh, they definitely would have seen this coming,” she says.